Sand Beach Rd. 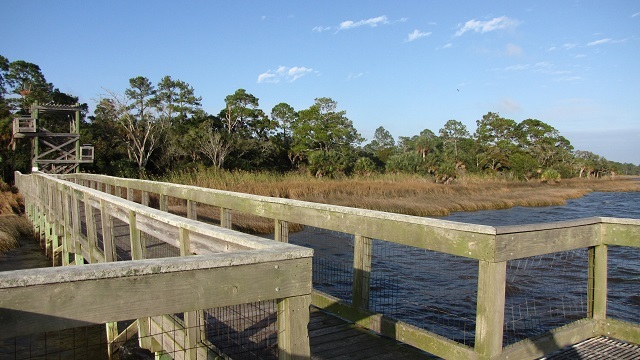 ends at a pier and wildlife viewing tower, in a nice hammock where Yellow-throated and Orange-crowned Warblers (winter) can be seen. East Bay can be full of birds between November and March, scope for Forster’s Terns, Horned Grebes and rafts of Lesser Scaup and Bufflehead. Caspian Terns are occasional visitors. A Bald Eagles nest is visible from the tower, and Northern Harriers can be seen quartering the marsh during the winter months. In summer, Swallow-tailed Kites can be seen drifting over the trees. The area roads can be interesting for birding and butterflying, particularly Tank Island Rd. and Butcher Pen Landing. In spring (good) or fall (best), take the wildflower driving tour to see the spectacular patches of flowers along these roads. Also, look for Black Swallowtail, Eastern Tiger Swallowtail, Gulf Fritillary, Viceroy, and Cloudless Sulphur. Shallow streams across the road (low water crossings) have firm limestone bottoms, and are not an obstacle to 2WD vehicles, except during very high water. These are a hydrologically sensitive alternative to culverts. Seasonal hunting takes place throughout this area; please click here for information on dates, regulations and more.